If you like family type movies you will not be disappointed as this is an all round one for both young & old with a good message to bring out the best in all of us! Brought our granddaughter for her very first movie. Very sweet movie and a great message. I took my grandson but now I have to take my husband. It's not just for kids. Don't believe the person who said it was over-rated. This movie is fantastic. Hugh Grant was a fun surprise. Someone said the first one was better but I disagree. He got into so many scrapes the first time - like the bathtub flood - too much. This one was perfect. 3 generations of us just loved it. Better than the first. Mystery and suspense and a happy ending for all. Paddington makes everyone and everything better - neighbors and prisoners alike. Fun to see Hugh Grant in a different kind of role. 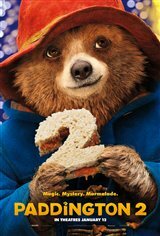 Awesome, most entertaining amusing , entangled misadventures of a little, cute marmalade loving bear. Enjoyed the first Paddington, brought back fond memories of past history . LAUGHING and CRYING This movie is great for kids and adults. My wife was crying at the sad parts and we were all laughing at the funny parts. I have not laughed so much at a movie in a long time. Our seven year old daughter just loved it. Prisoner P2 in jail is not really appropriate for the kiddies as it has the bear locked up for a pop-up crime he is accused of committing. But not to worry as everyone in the neighborhood pitches in. The first P1 movie was far better than this jail house rock P2.